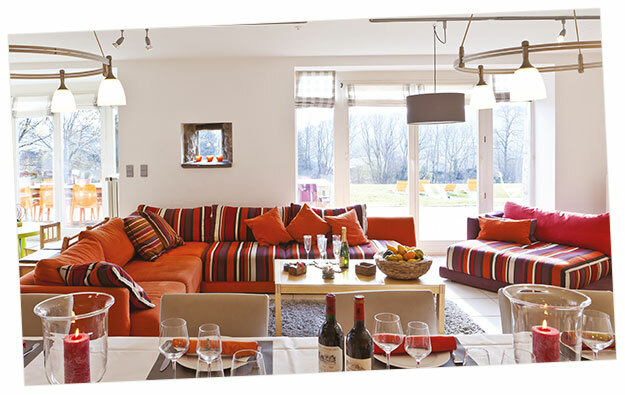 We select holiday homes that are on the Ardennes-Etape website. Ardennes-Etape is not a portal. Not everyone can place his holiday home on our website. We meet the owner in person. we evaluate his house. And if we are convinced that you are going to like his house, we will add it on our website. 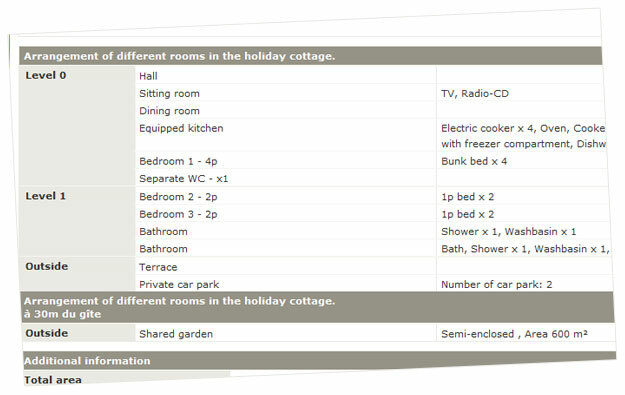 We do not have the intention to add holiday homes to our offer at all costs. We absolutely want you to be satisfied with our work. We calculate the right price. The rent, the handling charges, the usage costs, the taxes. All that needs to be paid is included in the price. We show you the total price. This means you do not need a calculator or Excel sheet in order to be able to know the pricetag of your holiday, neither for choosing the best price/quality ratio. Choosing your holiday home should be simple! When we launched this service, 53.76% of the respondents found the display to be fairly clear and 43.35% found it to be very clear. 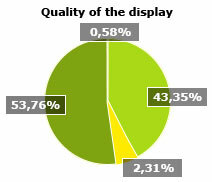 Only 0.58% found the display not to be clear at all. 43.93% of the respondents to our survey indicated that this display would help them a lot in choosing a holiday home. 41.04% indicated that the display would help them reasonably. And what if the costs depend on your usage? 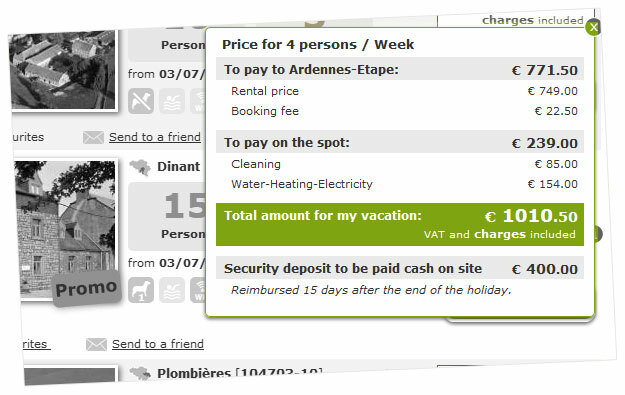 How do you know how much to pay at the END of your stay for water, electricity and heating? We estimate these costs for you, based on previous reservations. 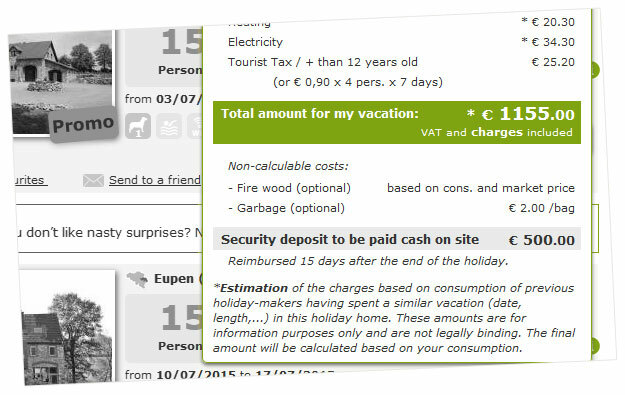 The owners communicate the amounts they invoiced to holidaymakers after each stay, or they provide the average amount that they invoice depending on the season. And we provide you from all this information. It is accurate, but unfortunately we cannot see into the future. It is an indication of your holiday budget. At the end of your stay, the owner will inform you about the usage volumes and the price. When we launched this service, 58.19% of the respondents found this diplay to be fairly clear and 33.33% found it to be very clear. 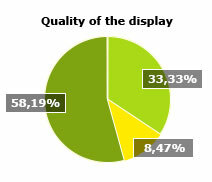 Only 8.47% found the display to be not clear enough. We supervise the quality throughout the year. We read all satisfaction surveys. On average, 7 out of 10 holidaymakers respond to our satisfaction survey. Whenever a problem arises, we inform the owner. If we think that a certain aspect of the house can become an issue, we warn the owner about this. If your holiday is not running smoothly as expected, we will contact the owner. And the owners always keep us up-to-date concerning the progress of modifications or adaptations they made to their house. 4 People are working full-time on the quality of your holidays. 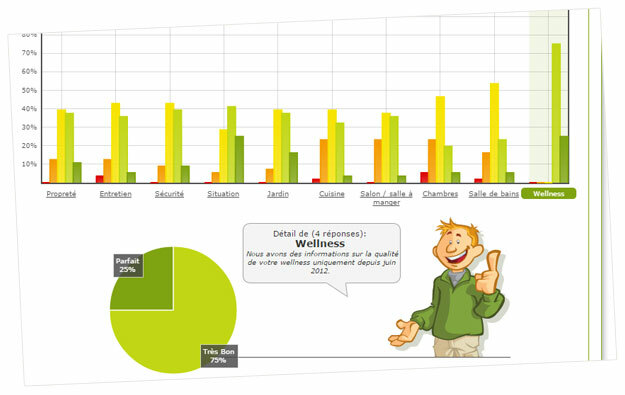 Per year, Ardennes-Etape receives about 2% of complaints concerning its stays. Sometimes you file a claim, sometimes we file a claim and sometimes the owner files a claim. Indeed, sometimes the owners are also disappointed. And we need to be there for them as well. 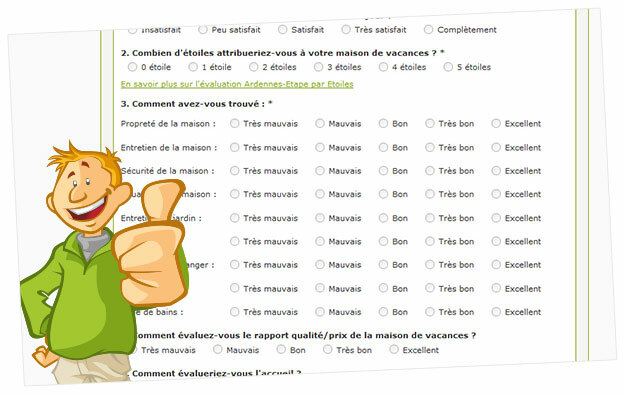 The Ardennes-Etape holiday home owners have real-time access to the evaluation of the quality of your house. They have got access to statistics and monitor their quality score closely. That is the reason why their house is on our website. Because for them, quality is very important too. We revisit the holiday homes, as well as when everything runs smoothly as when there are a few concerns. We share our experience, our expertise with the owners. We have learnt this thanks to your needs and expectations. We help them to manage their holiday home with professionalism and fun. 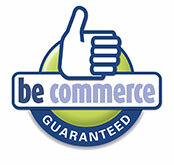 For us, both aspects are indispensable in order to offer a high-quality service. Twice a year, we publish a specialized magazine, and thanks to our newsletter we keep them up-to-date concerning the actuality in the tourism industry. We describe the holiday home with care. Which makes perfect sense, since we have visited it ourselves and took the pictures by ourselves. Our descriptions are highly detailed. And the advantage of having a website is that all modifications in the house are immediately being modified in real-time on the website. We photograph the house from every angle. We take a lot of pictures, long shots and detailed pictures. In general, you are very satisfied with our pictures. They are beautiful and realistic, which poses a real challenge. Sometimes you feel like certain aspects of the house are not being demonstrated enough. And then we take new pictures so that all aspects of the location are being clarified in an excellent way. 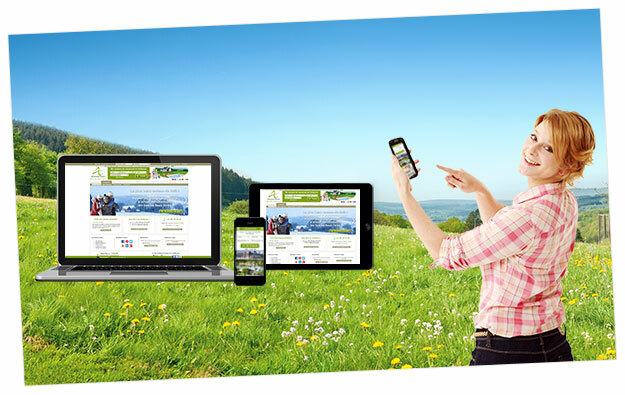 Just one website that adapts to all screen sizes. 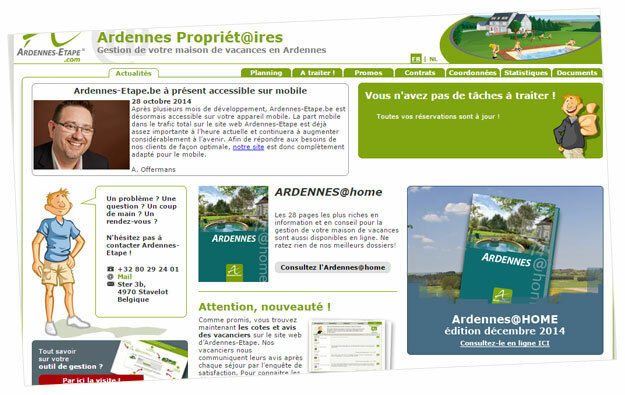 Give us your opinion regarding to the website through an e-mail to info@ardennes-etape.com through our contact page.